very nice apartments and friendly/helpful staff. Great for families. Excellent! If you have a car then the slightly remote location is no problem at all - just takes 5min to the slopes. I spent a lot of time reading reviews in the area in an attempt to find a place that would offer peace and quiet, and I am delighted that we found it. The apartment is spacious, and it is very clean and comfortable for a couple. The kitchen is well equipped with everything you need to cook full meals. The amenities are modern, and the wi-fi worked well. As other guests have mentioned, you must have a car, as there are very few services nearby. The advantage to this is that it is very relaxing and quiet with no noise from the street. In addition we did not hear any other guests, the apartment was silent. For a small fee you can extend your stay for an evening check out. Though we did not take advantage of this, I think it's a very nice convenience for those who want to ski for the day and have a shower before departing. Amazing view of the slopes, great host, and wonderful apartments! Easy ski storage and great transport to the lift by a great driver. Perfect place for a skiing holiday! Absolutely loved it! The sauna and the jacuzzi after a day skiing was haven. The appartement was big and comfortable. It had all mod con. And the staff was very helpful. Personal muy amable. Sobre todo la persona que nos llevava a pistas muy amable y puntual. La cama era muy comoda y estando bajo 0 la temperatura del apartamento era incluso elevada (facilmente regulable cerrando un poco los radiadores). Buen servicio para pedir pan o desayuno. Vue sur montagne, spa, qualité literie, et couette, meubles bois massif, calme, navette pour station ski, local a ski au même étage que le navette, accueil sympathique, équipements, propreté, ménage inclus, tv cablée salon et chambre. Trés bonne prestation avec possibilité se se faire livrer pain viennoiseries et repas. On est pris au sérieux et respectés. Nous recommandons cet hôtel et nous reviendrons. El spa, y la posibilidad de usar el transfer para las pistas, Simón muy amable. Lock in a great price for Apartaments Els Llacs – rated 9.3 by recent guests! Apartaments Els Llacs This rating is a reflection of how the property compares to the industry standard when it comes to price, facilities and services available. It's based on a self-evaluation by the property. Use this rating to help choose your stay! Just 1.2 mi from the slopes of Soldeu and Grau Roig, Apartaments Els Llacs offer free spa access and wonderful mountain views. Free transfer to the ski slopes is offered and a private parking is available on request. 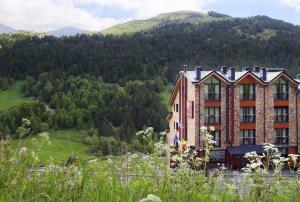 Els Llacs has a well-equipped fitness center, and a spa with hot tub and saunas. 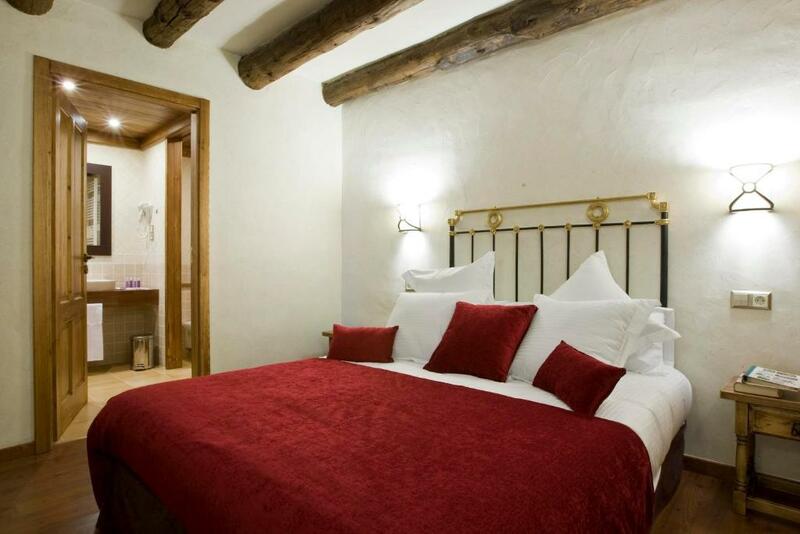 All of the apartments in Els Llacs are individually decorated in mountain style. All have parquet floors in the bedrooms, heating and electric blinds. Some of the apartments also have either a terrace or balcony with mountain views. The lounges have a flat-screen TV with satellite channels and DVD player. Bedrooms have a small flat-screen TV. The kitchens are fully equipped with hob, oven, fridge, microwave and a Nespresso coffee machine. The bathrooms have hydromassage bath. 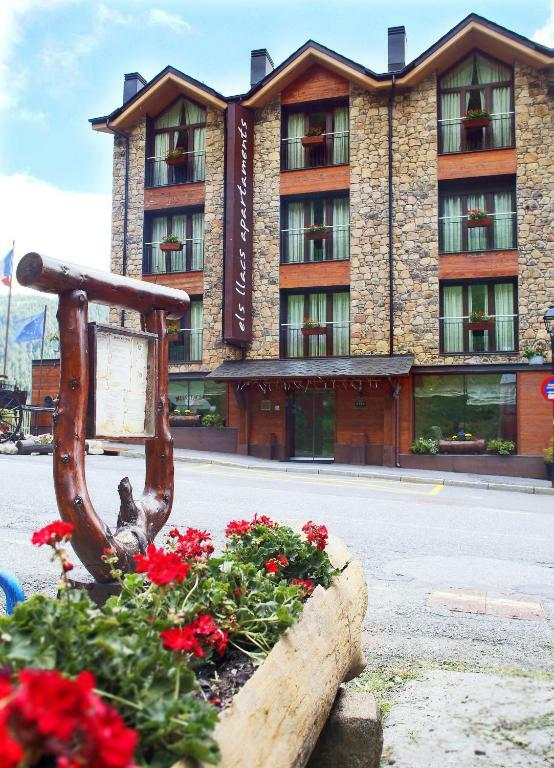 Grandvalira Ski Resort is just 1.2 mi away. 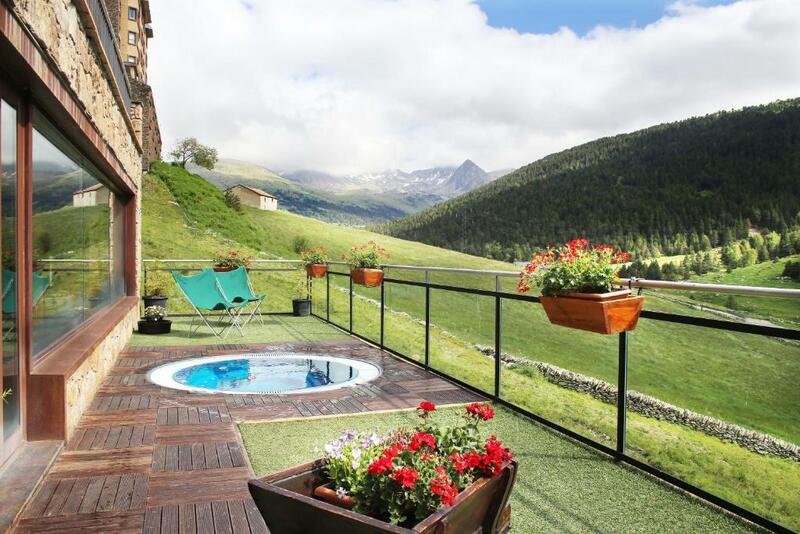 This property is also rated for the best value in Bordes d´Envalira ! Guests are getting more for their money when compared to other properties in this city. When would you like to stay at Apartaments Els Llacs? This 2-bedroom apartment has 1 double bedroom and 1 single bedroom. The living room has a sofa bed. There is also a well-equipped kitchen and a bathroom with hydromassage bathtub. This apartment includes free access to the spa. Private parking is available on site (reservation is not needed) and costs EUR 10.45 per day. This 3-bedroom apartment has 1 double bedroom with an private bathroom with a hydromassage bath. The second bedroom is a twin and the third bedroom may be twin or double. The living room has a sofa bed. There is also a well-equipped kitchen and an additional bathroom with hydromassage bathtub. This apartment includes free access to the spa. This apartment comes with 1 double bed. The living room includes a double sofa bed and the bathroom has a hydromassage bathtub. There is also an equipped kitchen. This apartment includes free access to the spa. This apartment comes with 1 double bed. The living room includes a double sofa bed and the bathroom has an adapted shower. There is also an equipped kitchen. This apartment includes free access to the spa. House Rules Apartaments Els Llacs takes special requests – add in the next step! Apartaments Els Llacs accepts these cards and reserves the right to temporarily hold an amount prior to arrival. Please note that check-in after 20:00 is only possible if advised in advance. If you expect to arrive after 20:00 please let the property know in advance, otherwise you may not be able to check in. Please note, unannounced arrivals between 21:00 and 22:00 carry an extra cost of EUR 60. Please note, check-in after 22:00 is not possible if not advised in advance. Summer season: from 16:00 to 21:00. We arrived late in the evening, and therefore did not go to the supermarket before our arrival, so it would have been great to have essential items to purchase, ie: coffee pods for the coffeemaker, water, and/or snacks. The parking garage was difficult to find the first time so make sure to ask reception for clear directions. The host Luis is an amazing person!!! The appartement is very close to the ski resort (3 minutes by car) but it's on a main road and there is nothing to do around (other than crossing the road and going to the restaurant they co-own; which was by the way expensive for re-heated meals. Won't recommend it). The last thing I didn't like was that you had to buy you the coffee pod (3€ each!!!!) To use the coffee machine. Had I known this, I would have brought a few with me). And PS: the indoor parking is at an extra charge (different from how other hotels work in other European countries).